Kiss your savings goodbye, the Steam Summer sale is finally here. From now until 1 p.m. EDT on July 5, you can catch some great deals on your favorite titles, or partake in some good ‘ole community fun. Head on over to the Steam Store to check out the pages and pages of deals. We’ve got our eyes on The Witcher 3: Game of the Year Edition slashed down to a mere $24.99, Firewatch at $8.99 and the side-splitting Valve favorite Portal 2 at $2.99. This summer, the more you buy and play, the more rewards you can get. Complete daily quests, like sifting through your discovery queue or stalking your friend’s activity feeds, to earn exclusive sale trading cards and stickers to adorn your bright, summery virtual sticker book. Because indulging is all the better when you get to show off just how much you’ve tossed into the pile, right? Use your trading cards to craft nifty new profile badges for your favorite games, or into the illustrious foil badge to net yourself a new emoticon, profile background and extra exp. But wait, Lord Gaben says there’s more. You can upgrade the foil badge as many times as you like and every time you level it up, you’ll get more emoticons and backgrounds. 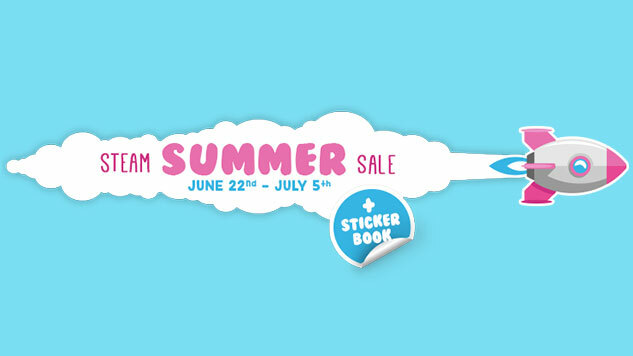 Act quick—all summer sale trading cards and stickers will expire on July 5. So craft all those badges, paste all your stickers in your book and show off just how delightfully full your backlog is becoming.